ViaBlue™ TS banana plugs establish contact to speaker jacks with a classical laminated system. On a circle are distributed nine small copper leaf springs divided into 40° sections. The diameter of the concentric ring in its fully extended state is 5 mm and in its fully stressed state 4 mm. The contact surface to the speaker jacks is added up from the nine pressure points of the concentric ring. 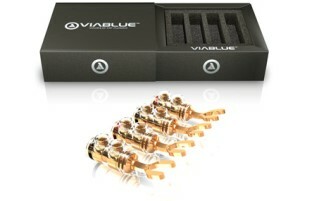 Speaker cables can be very easily and comfortably installed in ViaBlue™ TS plugs. 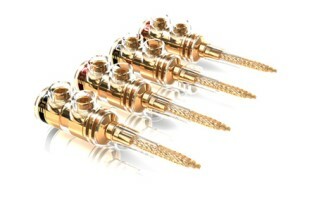 To do this, you will need a stripping tool to strip the cable's insulation as well as a screwdriver (hexagon socket 1.5) to fasten the cable in the plug-in connections. The speaker cable should be stripped approx. 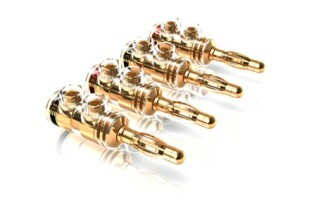 8 mm and then plugged tightly into the internal housing of the TS plug-in connectors. This inner part of the TS plug-in connectors narrows in such a way that the influx of air is cut off. In this way, the stranded conductors are protected from oxidation. 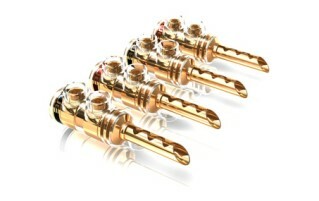 The cable can be comfortably tightened by the two large fixing screws and therefore has a very strong grip on the plug. Solder is not necessary. 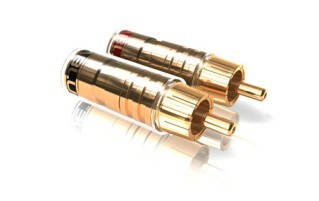 In order to protect even better the sensitive stranded conductors of a high-quality speaker cable from possible stripping by the screwing, as well as against oxidation over the long term, it is advisable to use the ViaBlue™ OFC copper crimp sleeves. ViaBlue™ TS flexible pins are used for connecting speaker cables with very large cross-sections to clamped connections and terminals. 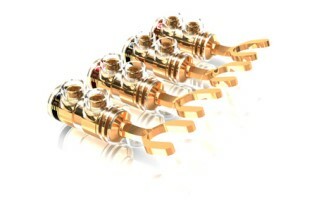 They establish contact to speaker jacks with a gold-plated stranded conductor. The stranded conductor is flexible and approx. 5 cm long. The flexible insulating tubing can be removed. ViaBlue™ ViaBlue™ TS spades are screwed on to speaker jacks and thus establish constant firm contact between speaker cables and terminals. The gap distance of the respective prongs is 6 mm. There are two different types with different fork sizes, the interior distance of the two fork points amounts to 6 mm and 8 mm. 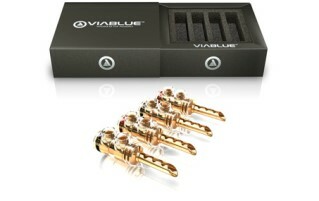 ViaBlue™ TS RCA plugs are gold-plated. The connector housing has a transparent plastic protective cover. Cables up to 8 mm in diameter can be mounted by soldering.